Redmond Gerard of the U.S. At 17, he won the men's slopestyle snowboarding competition. A teenager has won the first U.S. medal at the Pyeongchang Olympics, and it’s gold. Seventeen-year-old Red Gerard, from Silverthorne, Colorado, in his debut Olympics, won the men’s slopestyle snowboarding competition. In his final run Sunday, Gerard triumphed over Canadians Max Parrot, who won the silver and Mark McMorris, who won a second bronze after Sochi four years ago. In the men's luge, Austria's David Gleirscher took the gold while Chris Mazder won the silver to give the U.S. its first men's singles medal in the event. Germany's Johannes Ludwig took the bronze. His countryman Felix Loch looked set to win his fourth gold in the luge but he made an error late in his final run and was left out of the top three. High winds have led Pyeongchang Olympic officials to postpone the men’s downhill skiing event planned for Sunday. 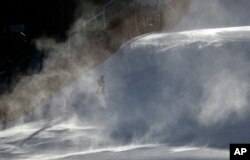 A course worker is shrouded in snow as it blows across the course where the technical events will be held before an inspection by competitors in the women's giant slalom at the Yongpyong Alpine Center at the 2018 Winter Olympics in Pyeongchang, South Korea. Winds were gusting to 72 kph at the Jeongseon Alpine Center. The event has been rescheduled for Thursday. The men’s super-G and other speed racing events will be moved back a day, to Friday, the International Ski Federation (FIS) said. On Saturday, Norway’s Marit Bjoergen entered the history books at the Winter Olympics in Pyeongchang. She became the most decorated female winter Olympian of all time when she won a silver medal in the 15 K skiathlon. It was her 11th medal — six gold, four silver and a bronze. Charlotte Kalla of Sweden won this year’s first gold medal when she won the skiathlon. She won the race by more than 7 seconds, breaking away from the pack in the final two kilometers to avenge her loss to Bjoergen in the 2014 Sochi Olympics. Krista Parmakoski of Finland won the bronze. U.S. skier Jessie Diggens finished fifth, the best-ever cross-country finish by an American woman. The winter games run through Feb. 25. Rafael Saakov of VOA's Russian Service contributed to this report.